Nicolas De La Cruz has returned to the Carpathian Mountains - his homeland - on orders from his eldest brother, Zacarias, to bring news of a conspiracy to the prince of their people. He is weary of his long existence and plans to end it away from his brothers, where they will be unable to stop him once he has fulfilled his duty. Lara and Nicolas' paths collide in an explosive adventure that rocks the Carpathian world. ©2008 Christine Feehan (P)2008 Brilliance Audio, Inc.
Would you listen to Dark Curse again? Why? No, I have read 19 of the Dark Series books and find it very frustrating for the characters that had great voices in the other books be reduced to the vampire drawl of Bella Lagosi. For example, Savannah who had such a great voice demonstrating a strong character was reduced to having a whiney Russian (I think) accent. Although I love the storyline, only when there is action, I cringed every time I heard the attempt at making, I guess, Romanian accents. Also, while I know these are part romance novels, the author spends way too much time describing every last detail. It wouldn't be so bad if it wasn't the same descriptions with the same outcome book after book. What other book might you compare Dark Curse to and why? This is my first vampire series. I try to stay away from repetitive material but now I am committed to finishing this series. What didn’t you like about Phil Gigante and Jane Brown ’s performance? I like when they used their own voices. It was horrible when they attempted to create accents for the characters. Can't believe Audible let them ruin the characters that way. No, think I have summed it up. really enjoyed the diffrent voices. a very good audio for the series. I'm a huge fan on Christine Feehan's writing and snapped up this audible book and cancelled my amazon pre-order. However, I have to agree with another reader that the narration was dreadful. It was rather jolting to go from American accented narration to these really horrible dracula voices. The woman reader in particular was terrible at separating the voices of each female character because of the attempted accents. Just when I would get into the story, the bad accents would start up and I'd be destracted from the story by the accents. Read the book, skip the audio. Sorry, but don't let Christine hear this audio version, it might break her heart. I enjoyed this book, it answered questions and actually posed some more. With the creatures discussed I am wondering what Ms. Feehan has in store for the Carpathians. The narration did not bother me at all. I love C.Feehan books but for some reason did not like this one as much. I really like having both a male and female narrator! And Phil Gigante is, without a doubt, the best there is. Period. I like Jane Brown as well (but P. Gigante is just amazing). So, I know the narrating was great and not the reason for my lack of feeling this one like the others. Characterizations were good and the story was solid. I can't put my finger on it. But, this book is a good addition to a library! And if you like C.Feehan, you will like this one! I was kind of disappointed by this book. The first issue was the narration. It was hard to listen to the accents and the harsh tones of the male characters. The story line was pretty good, but the childish rhyming spells became really annoying as the story went along. It wasn't the best in the dark series, but was adequate. I will definitely buy the book if the same narrators are used again. 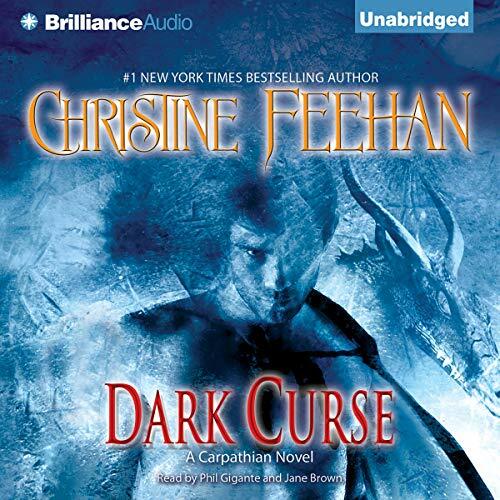 I am a huge fan of the Christine Feehan&#8217;s Dark Series. However I found the book disappointing. While I love supernatural books I have to draw the line when spells are put in books made up or not. The worst part though is the narration. The narrator mutilated the Carpathian male accents, giving them a bad Bram Stockers Dracula sound. I can't believe the narrators bothered to read or get the background on the other books before reading this one. It was absolutely horrible and certainly did not live up to the narration of the other books. I couldn't get past the first hour before having to put it down and just go buy the book. My advise don't waste your money buy the physical book. The narrators REALLY brought the story to life! I would listen to the book again and have. I love Christines books and have read them all. What was one of the most memorable moments of Dark Curse? I thought the most memorable moment in the book was when Lara found the microbe in the women and removed them from Raven and Savannah during the healing ceremony. To me that was a hugh time/moment when they identified the microbes, saved Raven's and Savannah's babies and determine what was causing the miscarages. This was the hugh turning point to be able to fight Xavier. It was then that Mikhail new what was causing the death of the babies and that his people now had a chance to survive. I felt the narrators Phil and Jane did an OUTSTANDING JOB!!! EXCELENT TEAM! They brought you into the story. MADE IT REAL!!! Yes because there were two narrators man ad woman. Any of them read by two narrators. What does Phil Gigante and Jane Brown bring to the story that you wouldn’t experience if you just read the book?